I have to confess, I'm getting interested in watching them play. They'll struggle against good teams playing hard, but I'm optimistic that they'll have their moments--partly because other teams will have a hard time getting up for them, and partly because they're athletic and hard-working. It has been a long time since we've seen a Bulls team get down court as fast as these guys do, including the bench guys. Justin Holiday evokes memories of the early Jimmy Butler--a very athletic guy with a modest pedigree who's getting his chance now and just might do something significant with it. He'll have nights when the shot's not there, but his speed and strength can be there every night. David Nwaba, too. His speed, power and leaping ability are off the charts, and he seems to have that killer competitive instinct (like Holiday) too. We'll see if he has the rest of the package. I hope so. I remember reading a national sports writer's coverage of the draft a while back. He excoriated the Bulls for giving away their 2d round draft choice to the Warriors, implying that the player the Warriors drafted was a clone of Draymond Green and a certain all-star. The writer did not happen to notice how many young players the Bulls already have on the roster; adding one more rookie would have been stupid. 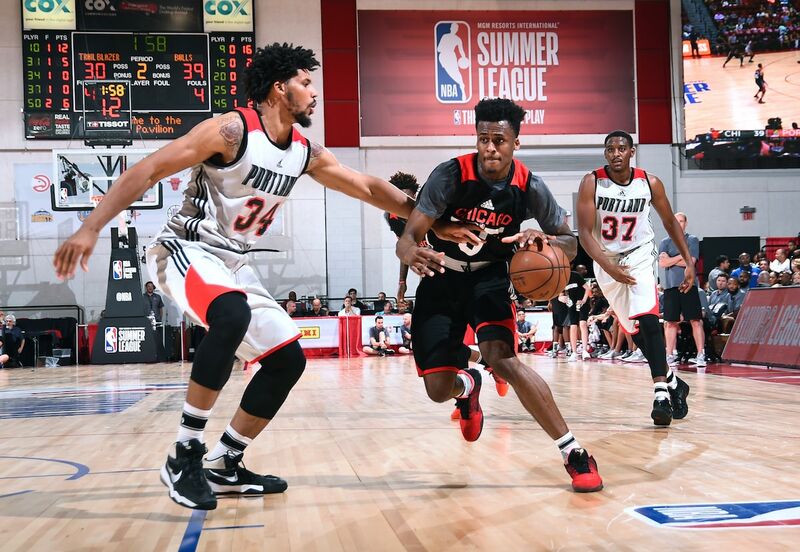 Nwaba, at least, has been in the league for a year and certainly comes on the court ready to compete. That looks like an enlightened swap, to me. Sam: Good point about the draft pick; I never got the angst about giving up a second round pick with so many young players, free agents, Europeans to pick from who may fit your style. Plus, it was ground zero of a rebuild and loaded with young players; what was one more role player more or less? What it tells you was an example of the anger that grips the country as well: We’re mad at things because we’re not as happy or successful as we might be, so let’s condemn everyone else. Maybe if someone else suffers more, then my suffering would seem less. Nwaba is intriguing and more ready than a second round pick for now, having been with the Lakers last season. What makes him unusual with this Bulls team is his aggressive attitude with the ball. You can see as soon as he gets it, he’s going to the basket with power and may get to the free throw line, which few really do well. The Bulls are going to have trouble scoring this season as things have mostly gone in the preseason, and getting to the line, which was Butler’s offensive strength. If Nwaba can make some threes and get the defense to reach to him, with his defensive ability he could be a real find. Take a look, by the way, at the story he wrote, Who In the World is David Nwaba for Players Tribune. It’s well done and unusual for an athlete; not saying they cannot, but few offer such personal essays. It’s very impressive, though if he makes it I am feeling a bit insecure at Bulls.com. After all, a player who also can write the games? Wonder how good he is with personnel and strategy. I don’t recall a season where so many teams have either pushed the reset button or are bad. Indiana, Atlanta, and Chicago have pushed the reset button while New York, Detroit, and Brooklyn are not very good with Cleveland, Toronto, Boston, Miami, and Washington predicted to make the Playoffs. Three (3) of the six teams mentioned first will have to make the playoffs simply because of the 8-team playoff format. It’s likely Detroit could be a playoff team. My point is, I think the Bulls picked the wrong time to hit the reset button because, If Zach comes back healthy or better as his prediction, the Bulls could be another 8th seed even if they don’t want to be? That would be considered a bad thing if the bulls slipped into the playoffs by default. What would happen in that case and what is your take on the East as far as playoff teams? Sam: You worry about yourself first; good advice in life first, if sometimes not popular. But if you cannot be successful and content, you’re not doing much else for anyone. Were the Bulls supposed to wait around to see what the Pacers would do with Paul George, the Hawks with Dwight Howard and Paul Millsap, the Knicks with Carmelo Anthony? Plus, it’s not like much has changed with the teams the Bulls couldn’t beat last season, at least in the long run: Cleveland, Toronto, Boston, Milwaukee, Washington. And wait until you get a look at Dwyane Wade this season. LeBron hides teammates’ faults better than anyone in the league, but Wade doesn’t have much left as great as he’s been. 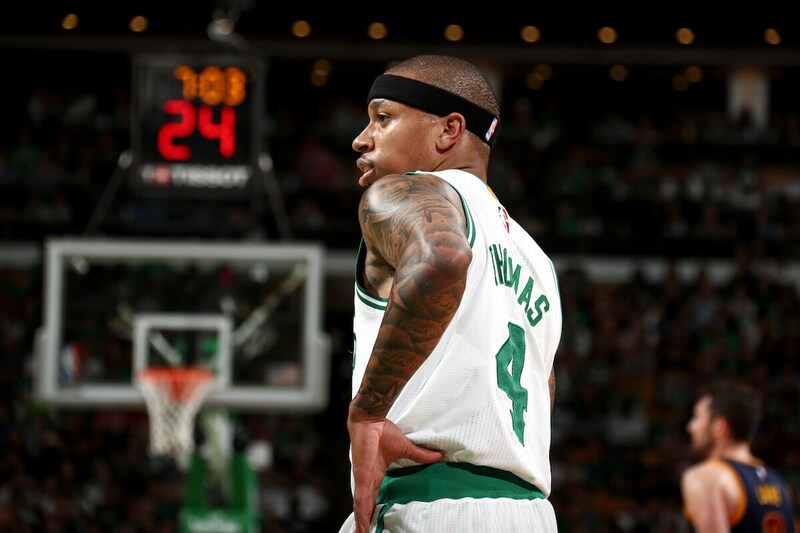 Plus, I noticed Rondo already is out a month or more with hernia surgery. You mean it was too soon to move on from that beloved team? Yes, Jimmy is terrific. But how were you getting someone else of substance? Paying $90 million for Millsap, like the Nuggets did? No, it was time, and maybe you make the case better a year before. But the Bulls wanted to give it a shot with Butler, and he deserved a chance. Not that it was his fault, but they still made the playoffs the last moments of the regular season. And when Rondo went down, they lost three of four at home to a Boston team with their best player in mourning and handicapped, as it turned out. That’s a long way from serious competition. It’s a long season ahead without Zach LaVine and Kris Dunn to start, but the play is energetic, the enthusiasm is there; it’s an upbeat atmosphere and a promise of better things to come. Are they good enough to “ruin” it by making the playoffs. I don’t see it. The good news is that we have about 10 decent bench players. The bad news is that four of them start. Let's hope that Dunn, Lavine, and Markkanen can make the Bulls a watchable team this year. So far, I'm rather impressed with Dunn, bad finger and all. Sam: Dunn, in many respects, is the biggest piece for now, I think. I believe LaVine will be better, but it’s so vital in this era to have an athletic point guard who can either get to the basket and make plays or shoot; both would be nice. One would be a good start. Yes, it’s a team of role players now being sorted out to see who will be a good role player if they can manage to add a few stars; or grow some. So in some respects it’s on them. Can Markkanen become Dirk? Can LaVine become Kobe? Can Dunn become Jason Kidd? They all have chances, especially because they are so young. It’s also why despite some curious media skepticism, I thought it was potentially a great trade. The Bulls acquired, effectively, three top 10 lottery picks. Dunn was 5, Markkanen 7, and LaVine would be top 5 in any draft now. Sure, they have to become something, and Butler already is. But you build with a core of top 10 picks. The Bulls have that and probably another to come. It seems like a good start. I read the criticism of Gar/Pax. I feel Paxson is an excellent assessor of player skills and has done a reasonable job considering the unforeseen Rose injury. I feel they did OK with the Butler trade. However, the risk of being more patient before trading Butler for the Minnesota goods outweighs the certainty of making the trade. Waiting allowed the Bulls to be an opportunist to another team unforeseen problems. They were the perfect team to take Isiah Thomas for Butler and the Brooklyn pick. They could handle Thomas missing most, if not, the whole season. I do not understand and am not OK with the OKC trade of Gibson, McDermott and the now high 2nd round pick for garbage. How could they have missed how bad Cameron Payne is? Sam: I understand second guessing; it’s a sports religion. After all, don’t you always make the perfect investment? Pick the right horse or card? Buy at the bottom of the market and sell at the top? Kept all those baseball cards when you were a kid? Running a sports team is very much like that; it’s much easier to get it right after you know the result. Predicting human behavior is far from science. The point is having a reasonable foundation and philosophy for your decisions. I think the Bulls did. First, with Boston and Butler, no offense, but why not Butler for Kevin Durant? You say Golden State wasn’t interested? Well, Boston, by the way, never wanted Butler. Whatever their reasons were, they weren’t interested. Never made an offer for either lottery pick, the one that went to the 76ers or Cleveland. They were interested in Kyrie Irving as they had plenty of wing players; they wanted a star point guard. As for Payne, it was a shot. They didn’t have Dunn yet and didn’t know if they’d make a trade. Rondo wasn’t a long term answer and Payne was a lottery pick who hadn’t played because of Russell Westbrook, and who would behind him? The Bulls weren’t going to bring back Gibson at his age having to see if Portis and Mirotic could play, and they’d given McDermott his chance. I might have kept him, but there was a priority to get more athletic, which they have done, and would not have by keeping McDermott with Mirotic. So you say why’d they move up to draft McDermott? It made sense at the time. I know Thibodeau also was lobbying for the deal. He was begging for a perimeter shooter like Korver, and McDermott was considered a more athletic Korver. I ran into Thibodeau that draft night and he was beaming; told me he couldn’t believe they’d pulled off the deal. Said it was the guy he most wanted. I was for it as well; you always benefit moving up into the lottery. Well, almost always. Payne got hurt and it doesn’t look like he’ll make it back; maybe he will. But given the Bulls weren’t going to keep Gibson and McDermott moving forward, it was worth a shot given their point guard situation at the time. Not all investments go up. Other than for critics, of course. I was reading last weeks mailbag and you talked a bit about how Olympic and national basketball during the off season can be physically taxing. I wonder if that contributed to Derrick Rose's injury. Do you think the NBA's big stars, who are mostly American, should avoid playing for the national team to avoid physical wear and tear. Our country obviously has enough talent to hold our own without them and it would also be beneficial to less famous players and give them more of an opportunity to shine. Sam: I don’t think it had anything to do with Rose’s injury. You never know what causes a serious injury like that, but you can draw a line that season from the lockout and abbreviated training camp, Rose with a game winner in game one and playing 40 minutes and more immediately, hurt the first month and with seven different, albeit “minor,” lower body injuries that season leading to that fateful Game 1 in the last few minutes after having played almost 40 minutes. Some guys do that and never get hurt. Who knows, but Derrick was long removed from USA Basketball. It’s unlikely players can get out of it as several teams, notably the Mavs with Dirk Nowizki, have complained. But the NBA made a deal with FIBA, the international body, and the league mandates teams to allow players into the competitions. Teams hate it for obvious reasons, that they owe these guys tens of millions on guaranteed deals and they could be hurt or slowed playing for basically nothing not for them. You’d say the players could make it a point in negotiations with how powerful they have become. But they aren’t likely to give up something for that given the international players are under considerable pressure from their home countries to play, and the USA players’ sponsors love them in the international markets. You know, good for the brand. I’d say it’s biased to objectify them like, but they’re the ones usually talking about themselves as brands. If only that trend was in vogue when Xavier McDaniel played. I don't think the Wolves will be as good as people think. I see GS, San Antonio, Houston, OKC and the Clippers having a better record than the Wolves this season. I think Denver is overlooked. Jokic doesn't get much attention but he's very good and they added Milsap which was a great pickup. Utah will be good as well. I'm not so sure about NO...unless they make a trade. Portland and Memphis are still there too. Anyways..I see the Wolves starting out slow. I like Jimmy...but he led the Bulls to a .500 record in the East. He'll have to lead the Wolves to at least 10 more victories this year if they want to make the playoffs. With Crawford as their only good long distance shooter, we'll see. Sam: I do think the ‘wolves are going to be a team to watch, especially here with Thibs, Jimmy, Taj and Jamal. Talk about your brands. They always kidded Jimmy around the Bulls for “going Hollywood,” his friendship with actor Mark Wahlberg, famous pro athletes. He’s extended that now with perhaps the most national publicity of any NBA athlete this summer, the big Sports Illustrated feature, magazine profiles in Hawaii. I do think Minnesota will be good, but I think it depends more on Towns and Wiggins. They’re calling Jimmy the closer, but Jimmy needs slow down isolation for that. He can finish and get to the line; but you can’t rely on that completely. They’ll need to sort that out, but I do think Towns and Wiggins are so good they could mesh. They have a lot of that meshing to do, so I think they will be a drama in their own right. I think they have a chance for top four as I don’t think much of the Clippers and Houston (I don’t see this Paul/Harden thing going over very well) and the Spurs could start slowly. I think OKC could move into second, and then Minnesota could be in that group with the Spurs, Rockets and maybe Denver. I know Bulls fans will be watching. 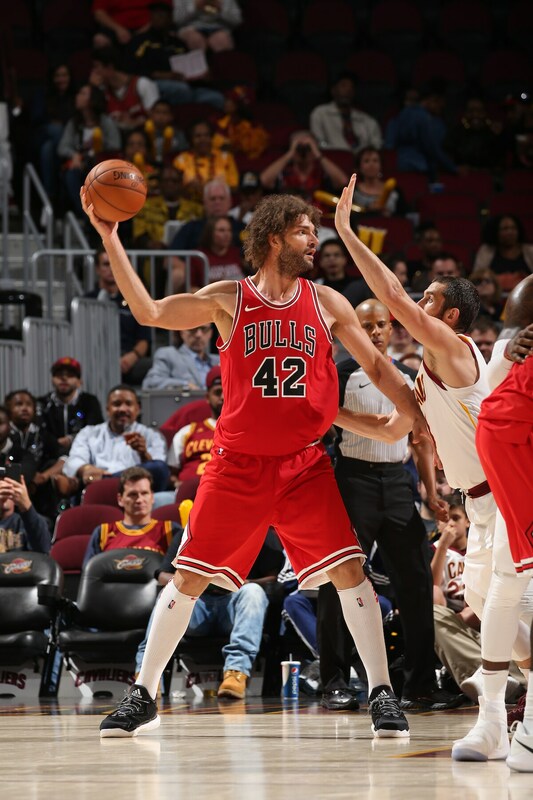 If the Bulls are serious about a rebuild then they should consider moving Robin Lopez and one of the power forwards. I like Mirotic over B Portis. How about seeing if Philly would bite on a Robin Lopez+Bobby Portis for Jahlil Okafor+2nd round pick. I think Okafor would be worth the risk. Lopez is not a part of the long-term future. We should be looking to add some young potential guys. They have the cap space to take on lopez contract. Having Lopez and Portis coming off the bench would definitely be beneficial to the sixers who have playoff aspirations. While the Bulls clearly have lottery aspirations. Sam: The money isn’t even close, but just for discussion and beyond reality: The 76ers have invested a lot in that Embiid guy. I know, he hasn’t been healthy. But if he isn’t they may as well stay in the lottery. I do think—despite how reliable Robin is and unless it’s a good deal I’d like him to stay around—Robin is vulnerable because of the team’s future and priorities. I agree with that. I know Cristiano Felicio said he wants to play more, but this is not a 76ers-type quit/rebuild for the Bulls. The Bulls also feel they owe a responsibility to their fans, the league and the dignity of the game to compete while going through this process. Robin would help with that, and I’m a believer that winning and losing become habits. It’s nice to throw a season for a lottery pick, but I also think you help give your players a losing mentality it takes a few years to break. Look, this has been going on for the 76ers for five years. The 76ers do have a conundrum with Okafor, who seems to be the guy born 20 years too late. In the 1980s, he’d be a force in the NBA. But the game has changed so much to virtually eliminate the postup center not named Shaq and power/power forwards like Karl Malone. Plus, Okafor has had an NBA career of health problems (they’re common with the 76ers and I blame the crappy cheese on those cheesesteaks) and also is closing in on a contract extension. Ready to trade for him and start negotiations? I don’t think he’s a bad kid, but he has had his share of embarrassing moments. I think he would be an intriguing risk for some team because he has gotten in better shape and has impressive scoring abilities with soft hands and good feet. As a No. 3 overall pick, I think the 76ers still are trying to get more value than the league will come close to giving now. If Embiid is healthy, I think they’ll eventually take what they can and someone really might have a coup. Okafor was a consensus top 3 that season with Porzingis much less thought of. I’m not sure he’d make sense for what the Bulls are trying to do with speed and shooting. Again, Robin’s salary doesn’t seem to make sense or fit with the 76ers. Plus, coming home and not doing well can be uncomfortable. But a lot of teams eventually are going to kick some tires and may come up with some value. Besides the Bulls does Sam Smith have a 2nd team that you root for? Could it be the Knicks since you are from the state of New York? Or Brooklyn? I personally don't, but there are teams that I feel like there is a personal connection with a player. 1) Washington - Marcin Gortat. The only Polish player in the league. Before, we've had Cezary Trybanski and Maciej Lampe. Both of whom had very solid roles on the Poland National Team but did nothing as NBA players. Gortat, meanwhile, is a double-double machine. So I feel like I have to root for Washington, because of him. 2) San Antonio - Brandon Paul. Just signed a guaranteed two year deal. 6'4" shooting guard. Mr. Illinois when he was a high school ball player at Warren Township in Gurnee, IL. He was a fresh when I was a senior. I just ran into his brother at the grocery store last night with whom I graduated and we talked about Brandon. He played in Turkey, Russia, Spain, and G-League. Now, he gets his chance in the NBA. Can't think of a better team than the Spurs. They like to give out minutes for players that prove they can contribute. Sam: I grew up rooting for the Knicks, who were routinely awful, missing the playoffs seven straight seasons in the 60s before the rebuilding finally hit. It wasn’t any different then; they figured they could not afford to start again in New York, so kept adding veterans, Bob Boozer one year and then Len Chappell, Billy McGill, Gene Conley, Gene Shue, Kenny Sears, my favorite for some reason I cannot recall; Walt Bellamy. Man, did we hate Russell, Auerbach and the Celtics. And then finally they said the heck with it and went with all those draft picks, Reed, Frazier, Jackson, Bradley and they still compare all New York basketball teams to those. I’ve long moved on from teams to people, basically rooting for the people I know and like, which is the great thing about the NBA. Nowhere in sports do you get to know the players better as people, their flaws, their foibles, their fantasmagorie, them at their most fabulous. Paul is a good one from Illinois Mr. Basketball to the journey more common for players than the NBA we know. You root for guys like that, and what a great place to try. I'm more intrigued as to how the G-League develops as a rival to NCAA for young talent. One of these days a McDonalds All American is going to forego college for the G-League draft and some guaranteed money that's not illegal for him to take (looking right at Pitino). Sam: Perhaps this is the breaking point. We’ve always known with a wink and a nod how kids were paid thousands to lead them to particular schools that then made millions off their play. It’s not unlike the old Hollywood casting couch that everyone knew about, winked about and never said anything about. And now with the stories from the New York Times about Harvey Weinstein (broken, by the way, by Megan Twohey, daughter of former Tribune sports editor John) everyone is shocked, shocked I tell you. Big time colleague sports has been a fraud for decades, enriching coaches and administrators on the backs of the kids, who had no voice like those hopeful Hollywood actresses. Perhaps this finally breaks the hold that crooked business has had on the American conscious and the G-league becomes a true minor league alternative like in baseball. Sam: Like fighting injustice, it too often has too many tentacles, much like preseason. Let’s see if I can extract myself from that one. Yes, the preseason is the dress rehearsal, though you don’t have to get the lines right until the audience is there. It’s been an encouraging preseason, the Bulls playing with that pace they’ve talked about, unselfish, passing, making more than their share of threes, finding some jewels, like Holiday and perhaps guys like Nwaba and eventually Arcidiacono and Blakeney. A nice early show from Markkanan, some promise from Dunn before he went out and the appeal of LaVine, whom everyone talks about like a divine figure. The style of play and appeal is nice when they also win some games. The test will be if they start running off one of those 10 or 12-game losing streaks, and how appealing will they be then? But do they avoid that and surprise us all? Yes, so far no complaints.